I shot pictures right up through the last day of the 2008 Kansas State Fair. I chose to be on site with friends instead of working with the pictures last weekend - always a good choice, I think. Anyway, here they are; many of them will be pertinent next year. I showed some of the fair's best freebies in a previous post, but here are some final additions. 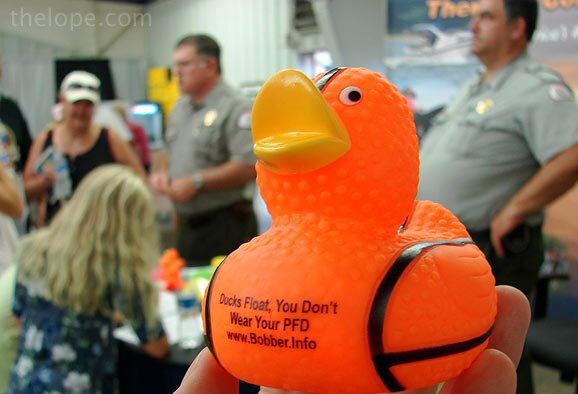 These rubber ducks were given by the U.S. Army Corps of Engineers National Water Safety Program as prizes for answering safety quiz questions. 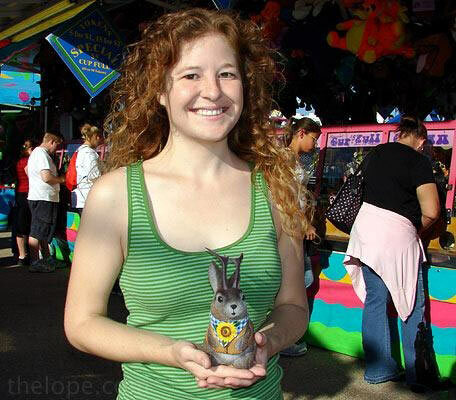 I made the duckie part of my catch and release program: I caught it at the fair, and released it to a Goodwill Store. 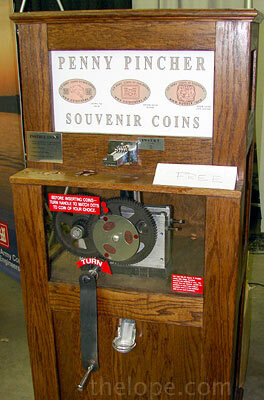 The same booth had a free squished penny machine. I understand that some people collect these smashed and imprinted pennies. For their enjoyment I offer the information that the Kansas Cosmosphere in Hutchinson also has such a machine, though it is not free. 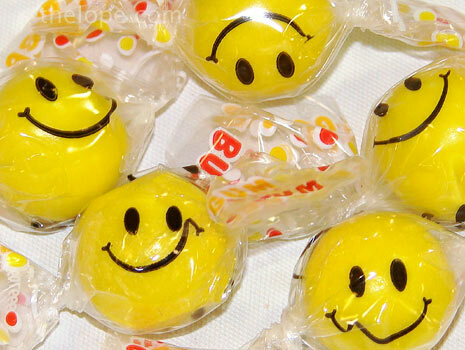 Candies wait for last-minute takers at a booth in the Meadowlark Building. 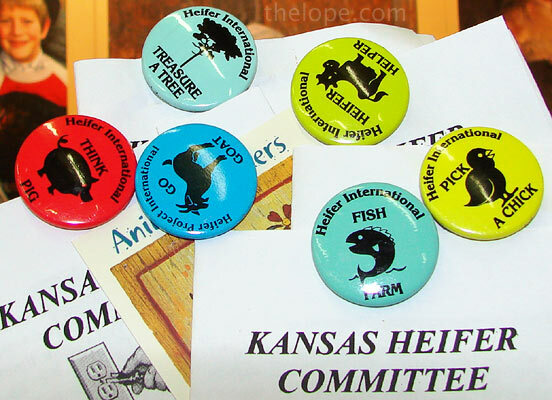 The Kansas Heifer Committee offered buttons - six different ones - on literature in the Kansas State University birthing center. The Oz building, an unremarkable but utilitarian metal building, is used for the display of art, photography and antiques. I was drawn to these plastic Viking ship salt cellars. 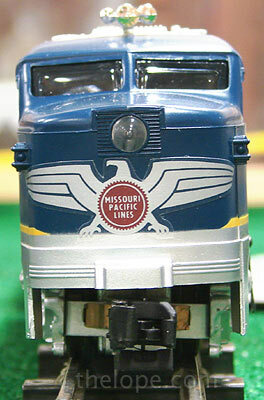 This is one of several model Missouri Pacific Alco diesel locomotives. A toy Marx steam engine, a robot and cement mixer wait in a display case. The antiques displayed in the Oz building are often quite interesting, but generally lack explanatory statements as to age, manufacture, etc., that would give them context. If even brief explanations were displayed with each object, the objects would be elevated from a curious collection to an informative and interesting exhibit. 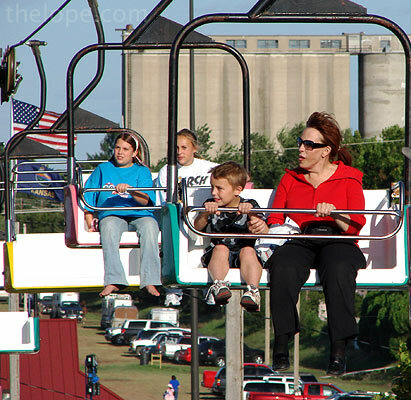 The Kansas State Fair contracts with North American Midway Entertainment to provide a carnival. The tower at left is the Mega Drop, a ride that offers the fair-goer a chance to be lifted to a great height and dropped...funny, when you think about it. Twelve people at a time ascend and descend the Mega Drop. I've read figures on its height ranging from 115 to 135 ft tall, it is made by Fabbri of Italy. I'm a bit apprehensive about heights, but decided to try this one anyway. Here's the view from my perspective of the ascent and descent. The trip down is very fast. 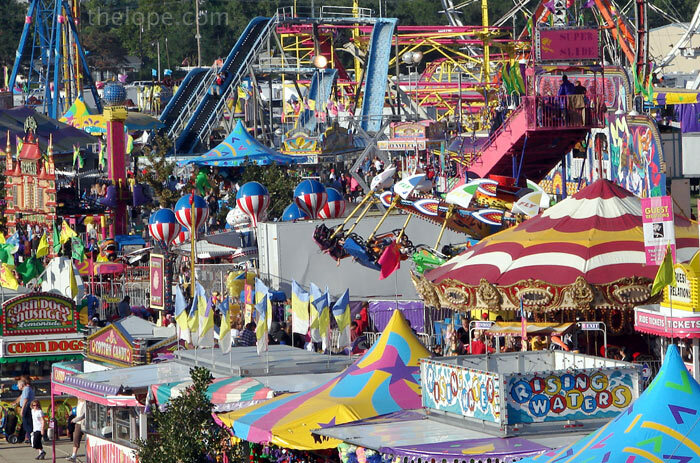 In a cursory glance through Internet groups devoted to carnival rides, I noticed a debate as to whether the ride actually gives the customer free fall, or if it isn't just a smidgen too slow. I'm betting on the later. In either case, it was fun. 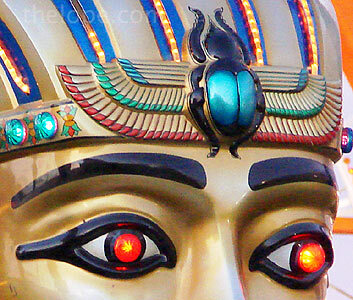 My friend Mark and I rode the Pharaoh's Fury, a ride that rocks back and forth. We still call it the Viking ship because that's what it was for a long time. These enthusiastic folks were seated opposite us. 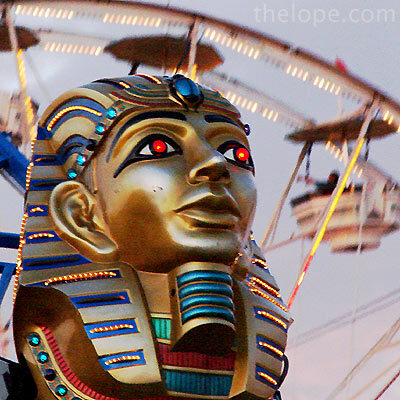 The Pharaoh's Fury is made by Chance Morgan Rides of Wichita, Kansas. 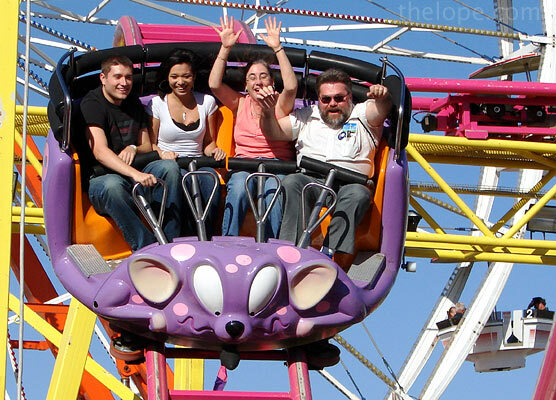 A pendulum-like carnival ride conveniently swings into the dead space of this photo. 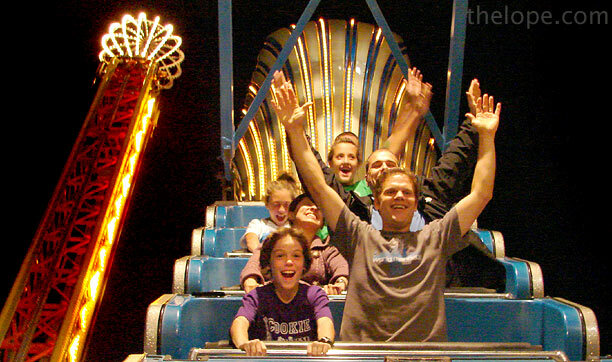 Mark (right) and Ava (next to Mark) are exuberant on the Crazy Mouse ride, a small roller coaster with cars that can spin. 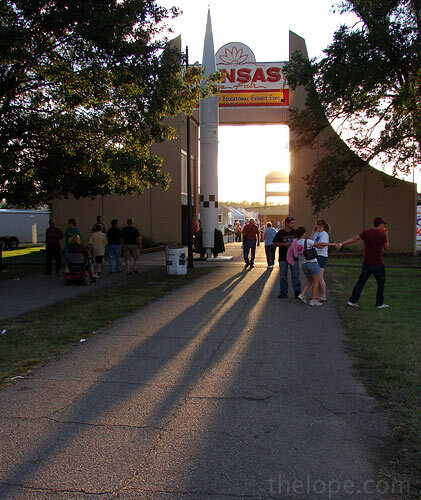 As the 2008 Kansas State Fair fades into memory, the most prominent recorded fact about it will probably be the low attendance, which was largely attributed to persistent heavy rains. Although this was a problem in the muddy parking lots, most of the areas within the grounds drained rather well. 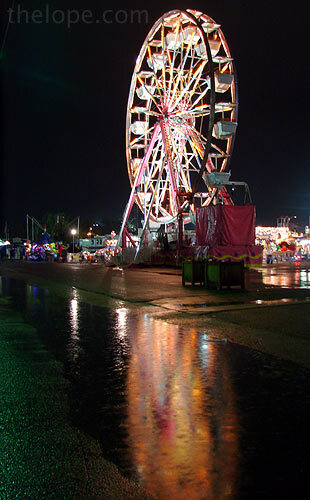 This puddle furnished a nice reflection of the big Ferris wheel, without really impeding anyone's movement. 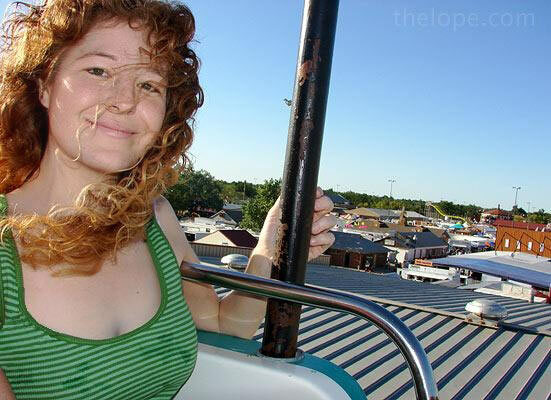 Tall rides afford neat views. Helicopters looked like toys from the top of the Ferris wheel. This was the first time I remember there being helicopter rides. They were $40.00 and I would have bought one if the doors had been off, as they were the day before (better for photos), and if I could have been guaranteed a seat on the side that would have afforded good shots of the fair from the southwest. 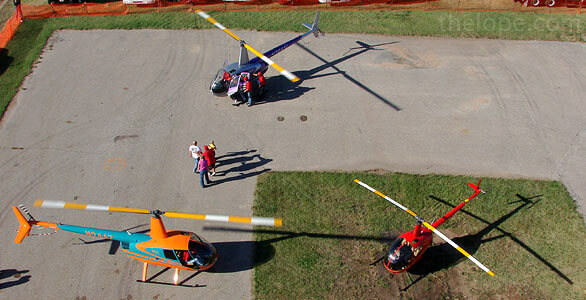 The rides were offered by Kansas Copters Inc. of Augusta. 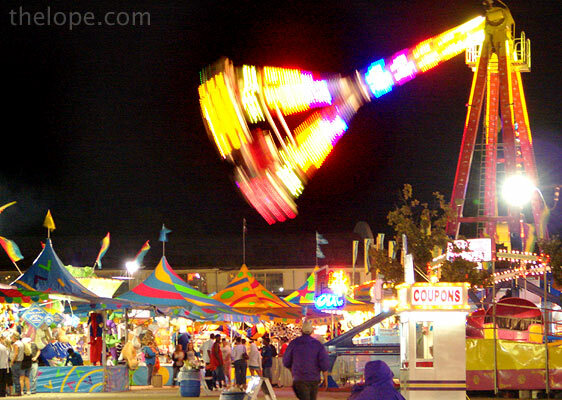 There's a wonderfully retro quality about some carnival rides. This is one of the top decorations of a kiddie ride that holds children in a laying-down posture similar to how they'd be situated in a hang glider. But in an earlier incarnation of this ride, I suspect the children sat in small airplane cars, of which this decoration is an echo. 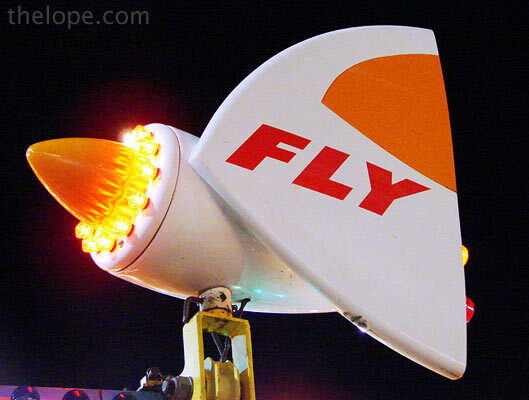 The type style used in "FLY" is very similar to that used for TWA, a defunct airline. 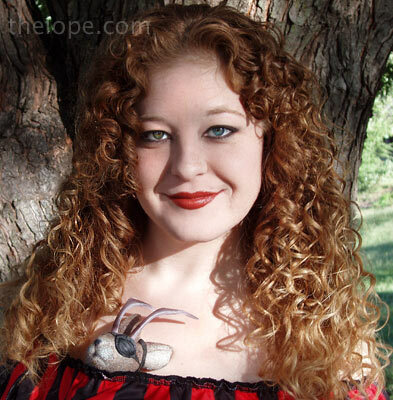 Who should we run into at the carnival but Rayne the Pirate Girl, co-star of our Talk Like a Pirate Day and Mardi Gras posts. She joined Mark, Ava and I for a ride through Ye Old Mill, during which we all got sprayed with water. The girls got it across the chest; Mark got it in the crotch. He was a little less happy than they were. I actually recorded this trip through Ye Old Mill in 2007, but the ride wasn't revamped for 2008, so I'm tossing it in now. Rayne had extra tickets for the sky tram, so she, Ava and I rode it. Three average people can barely fit in one of the cars. Rides were $3 one-way and $5 round trip. We added enough money to have three tickets for the later. 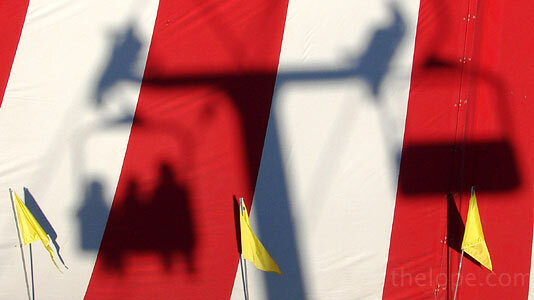 Our shadow crosses the top of the Hendrick's petting zoo tent. 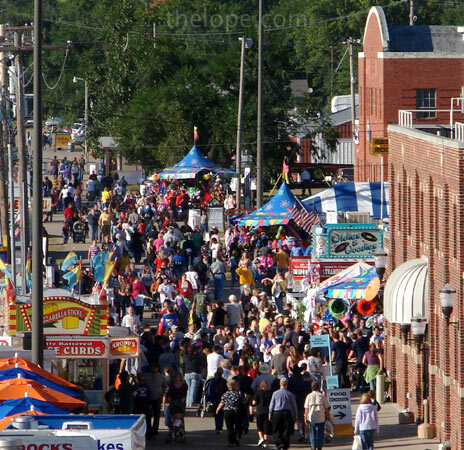 This was Sunday - the last day of the fair - and only the second sunny day. The crowd was pretty good. 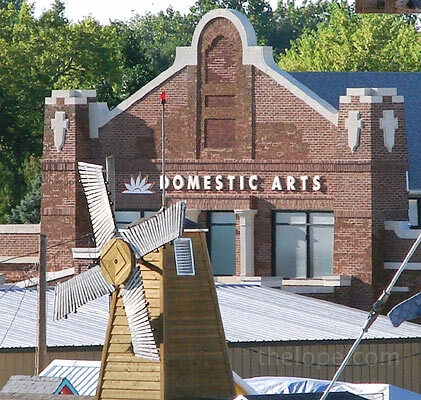 I had a nice juxtaposed view of parts of two of my favorite fair buildings, Ye Old Mill and Domestic Arts. Elsewhere on the fairgrounds, the peddle boats on Talbot Lake were not active. An operator told me that the heavy rains and subsequent high water had forced their closure since Friday. 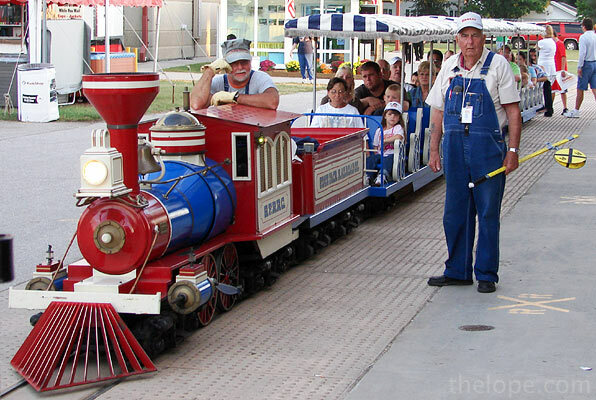 The fairs miniature train, the State Fair Railroad Company, was doing just fine. Rides on this were $2.50 for an adult. Saturday, we'd seen this frustrated train crew as a people-mover had stopped across the tracks in front of them. 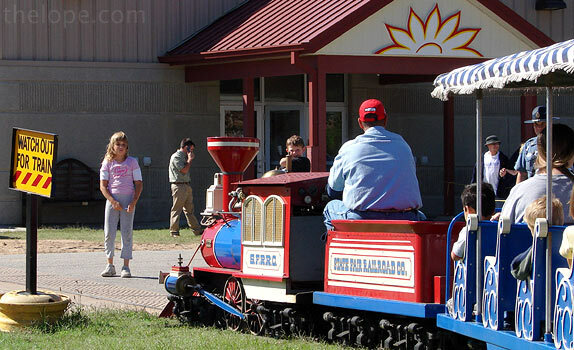 Here is a complete circuit of the train ride...sorry about the occasional wind noise. 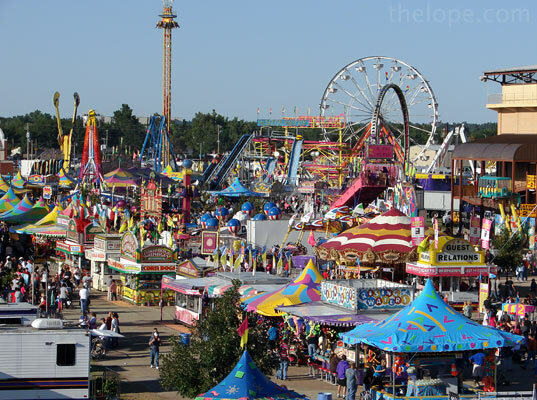 Concerts at the fair are almost always a bargain; just compare the fair ticket price for any given act to what the same artist would cost to see in other venues of a tour. Kansas (the band) members Richard Williams (Left), David Ragsdale and Steve Walsh opened the Friday, September 5, concert. The concert of the first Friday of the fair is often a rock group of similar vintage. Like most long-lived bands, Kansas has a convoluted history. 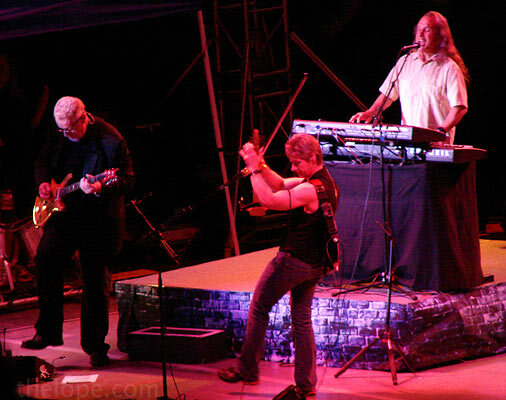 Walsh and Williams have been with the band most of the time since about 1974. Ragsdale is a more recent addition. 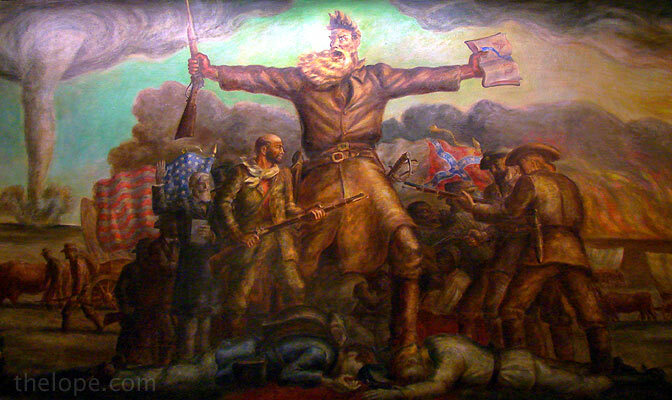 A bit of Kansas (the state and the band) Trivia: the cover art of Kansas' 1974 self-titled first album used a cropped version of "Tragic Prelude" (above), a mural of abolitionist John Brown, painted by John Steuart Curry and on display in the Kansas Statehouse. Styx followed Kansas; they also has a complicated history. They seemed more energetic than Kansas, but I still like the depth of Kansas' music better. 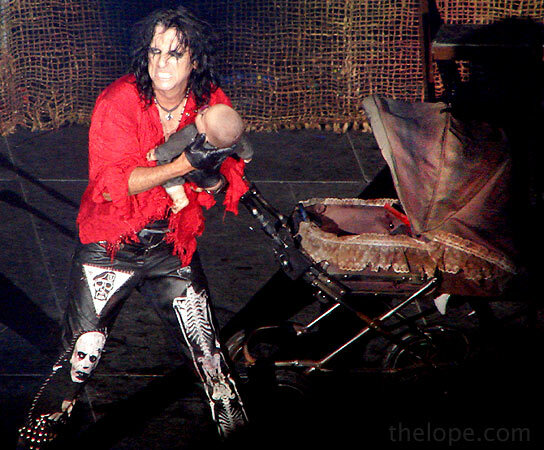 I've already run pictures from Alice Cooper's September 12 concert at the Kansas State Fair, and I have a huge honkin' Alice post in preparation for those of you who've asked, but here's a shot of him doing "Dead Babies" to tide you over. 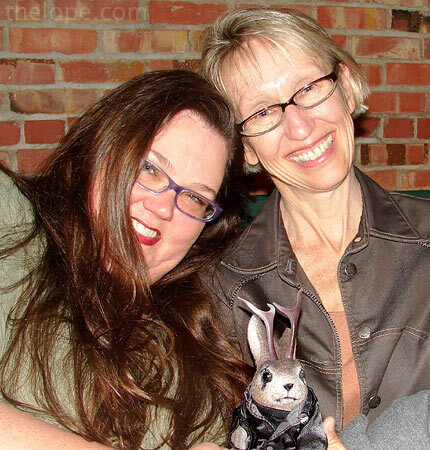 Blogger Patsy Terrell (left) and Hutchinson Mayor Trish Rose pose with Ace Jackalope after the show. I had tried to no avail to get a photo of Ace with Alice, but the company of two lovely ladies is not a bad fall-back position at all. For Patsy's take on the concert, and more of my pictures, check her blog. 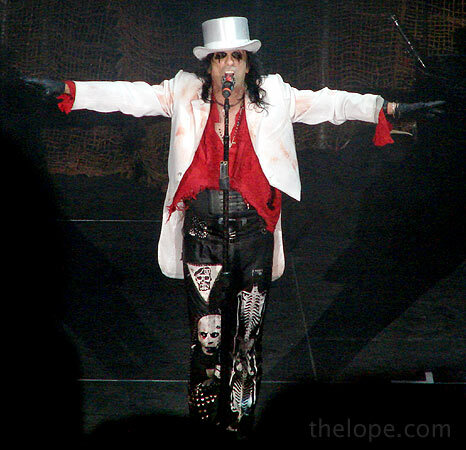 Here; have a dose of "Billion Dollar Babies." This may be as close as Ace gets to Barack Obama for awhile. We at Ace's Campaign headquarters figure that both Obama and McCain are afraid of Ace's debating skills as neither have contacted him about a debate. 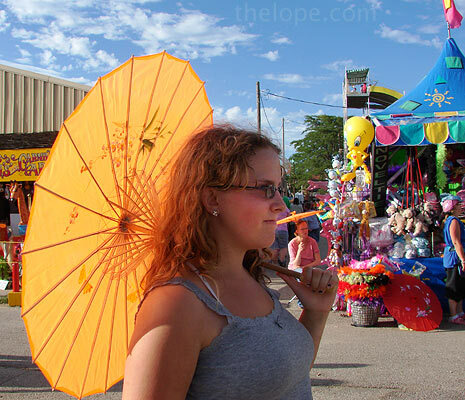 Parasols replaced umbrellas for the last two days of the fair. These orange ones were sold by a vendor near the Domestic Arts building. 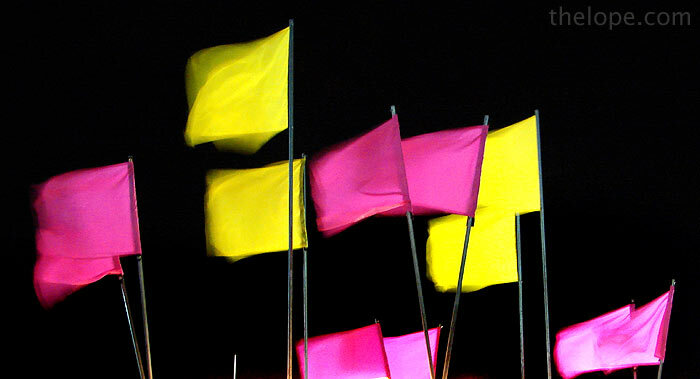 Colorful flags wave atop one of the food stands. I'll have to find out what function this vane served on top of the retired "sergeant" surface-to-surface ballistic missile that now serves as a time capsule. Time capsule material was placed in the missile in 1973; it is to be opened in 2013. 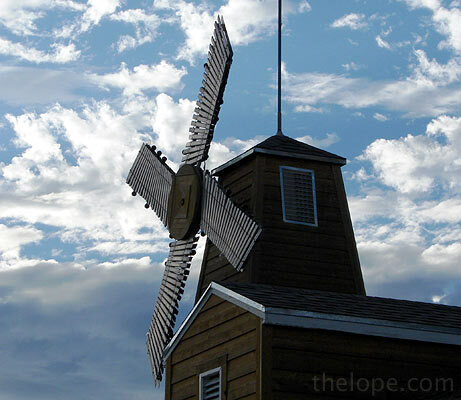 I love the fair; for ten days a bustling little village is grafted onto my town. With it come very real educational things - the agriculture base we too often forger our state is built upon. And if you're very lucky, around the edges and in the shadows creep dark and wondrous flights of fantasy...macabre automations and the early arrival of Bradbury's October People. 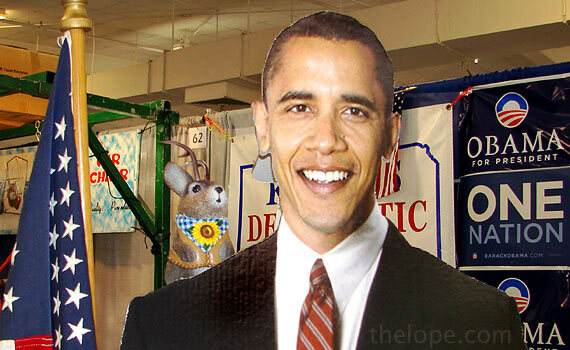 We hope to see you next year with pictures of interesting things at the 2009 Kansas State Fair.